If you’ve never played any of the PC Battlefield games from DICE (Digital Illusions Creative Entertainment), here’s the basics: Battlefield 1943 is a World War II-based shooter where you try to take out your enemies while capturing bases (control points), and defending those captured points from falling back into the enemies hands. Players can use a variety of vehicles including planes and tanks. Capturing control points allows the team to reinforce themselves by enabling players and vehicles to spawn in the area. The goal is to hold as many control points as possible (the more, the better). If your team holds them long enough, they win the match. Battlefield 1943 stays very close to the original Battlefield 1942 games and includes three levels from the Pacific campaign: Wake Island, Iwo Jima and Guadalcanal. The graphics have been updated and the game now uses the Frostbite Engine (from Battlefield: Bad Company). The engine allows for some amazing environmental damage; tank shells blast through walls and villages sit in flames after an air raid. The effects are truly impressive, and add a new level of immersion to the experience. 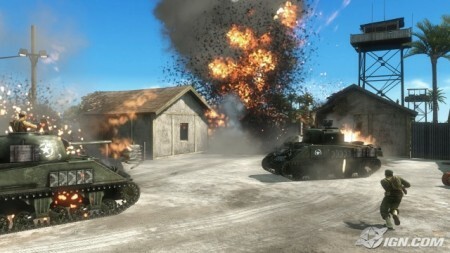 The game also features squad combat. If you join a game with a friend, they will be in your squad. Not only does this allow you to quickly see where they are and what they’re doing on the map, but you can now “squad spawn” if you’re dead, coming back to life right next to the selected squad mate (or inside a vehicle they are driving if there is an empty seat). That change might not sound too important, but it really does add a new dimension to the game play. Instead of having to spawn at a point and walk two minutes to your squad, you can now instantly spawn right next to them and get back in the action. Also added is an air raid. 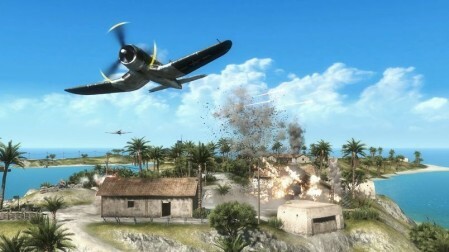 Certain points on the map allow the team that controls it to send in an air raid and rain down destruction on a group of enemies. This is hugely beneficial, if used properly you can stop an assault in it’s tracks, or obliterate an enemies defense right before an assault. The new engine – the graphical update is nice, yes, but really the greatest change is the environmental damage. If some pesky infantryman keeps trying to hit you with their bazooka, then ducking back into a building to hide, you now just blast the wall out of the way. Calling in an air raid on a control point not only kills the defenders, it also eliminates the houses they were hiding in, making an assault that much easier. Squad combat – Making it so you can quickly see where your friends are on the map is good, but making it so you can spawn right next to them is even better. Not only does it save time, it also adds to the game play. Defenders have to be careful and eliminate the whole squad, or else they will be reinforced again when their dead squad mates can back to life right next to them. It’s really a very cool change. No more grenade spam – Battlefield 1942 had issues…lots of them. One of the most annoying may have been grenade spam. The game had resupply crates to get more ammo, and players could just sit next to them and throw grenades…forever. Sometimes into another teams spawn point…killing everyone as soon as they spawned, which was amazingly annoying. Players used to also be able to pilot their teams aircraft carriers into unfavorable positions, which could easily ruin a game because the carrier would be the main spawn point on many maps. These, and many more, annoyances are now gone (infinite ammo, carriers cannot be moved / destroyed). Also, two of 1942’s old classes are gone: the medic and anti-tank class. These classes were often not used because their jobs were too specific and generally not as fun (but critical to a teams success). Now all classes have a way to deal with tanks, and players regenerate their health as long as they don’t take more damage. Enemy indicators – Enemies are not readily visible on your minimap. However, if someone on your team shoots and hits an enemy (and doesn’t kill them), the minimap instantly displays their position to you and the rest of the team. They disappear from the minimap if no one hits them again for a few seconds (they don’t keep contact with the enemy). I think it’s a great system to use, it’s a small detail I know, but it seems just a little more realistic. 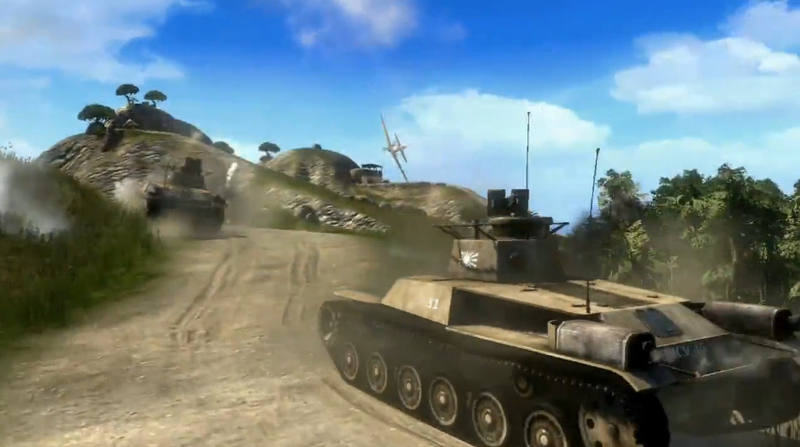 It’s just fun – The classic Battlefield 1942 game play is there, and it’s better then ever. The atmosphere is amazing, planes whizzing by, tanks lobbing shells at defenders, the battles that take place are extremely dynamic and never get old. Server issues – Joining games isn’t exactly easy right now. EA is adding new servers, but finding a game can be hard. Joining a game with friends can be even harder. This problem is somewhat typical of a new release, but I wish they would have anticipated the demand better. Three maps – I really want more maps, especially from the European campaign. Three just doesn’t feel like enough. A new map, Coral Sea, does unlock after players get 43 million kills (separate counters for the XBLA and PSN versions), which is a nice touch (as of this writing XBLA users have 31 million kills, so not long). Having to depend on your team – I know, it’s a team based game. I know, it’s not EA’s or DICE’s fault. Really, I think the biggest fault in the game lies with humanity itself. More specifically, how it’s nearly impossible to find just 11 other people to play with who actual realize this is a team game and all work towards that goal. The sad truth is that the chances of that happening are about 0%, plus or minus .0001%. Whenever I’m playing it feels like my squad is the only one doing anything, I’m not saying I’m amazing at the game, I’m not, I’m just asking people to actually do something for the team. Hardly anyone ever wants to defend, so points just go back and forth constantly. Also, the point system in the game doesn’t really reward defenders (you get a bonus for defensive kills, but it doesn’t out-weight the points you would see attacking). If there’s a point far from the action and you decide to defend it, you won’t see enemies often, resulting in far fewer points. Not to mention it’s just boring. However, if you weren’t there some enemy would just parachute out of a plane and capture it, allowing the enemy to spawn behind your lines. As an aside, just because a point isn’t on the front lines doesn’t mean it’s not readily accessible to the enemy (parachute, boats, driving a jeep across the map). I really think the game should implement a control point “locking” system. If there are three points in a row, and your team has the first and second (the enemy has the third), lock the first so the enemy must attack the second and capture it. Once they have it, the first point becomes unlocked and it can be captured. The locking system should obviously be presented in a logical manner so that points only behind the main lines are locked. Team Fortress 2 utilizes a system like this, and it works very well. Back on point…Players also love to just sit around waiting for planes / air raid towers (free, easy kills) / tanks / etc. to spawn, not doing anything for the team. I wish there was a solution to people camping the same vehicle over and over and over again. It’s so frustrating seeing a guy camp a plane, usually because, upon getting into the plane they typically a) fly into a mountain side seconds later b) get killed by a flak cannon or c) dog fight for the rest of the game, doing nothing for the team. They also like to ignore the enemy obviously capturing the point they’re at in favor of just getting in a plane again. Few are actually supporting the ground troops and taking out important targets such as tanks. Overall Battlefield 1943 is an amazing game, it brought back a lot of memories (some good, some bad) of playing the old PC game. The squad functionality makes it a lot easier to coordinate attacks within your group, though there is still an issue of the overall team coordination. The graphical update is very nice, as well, and greatly adds to the immersion factor.